This story was produced in collaboration with the Ravitch Fiscal Reporting Program at the Newmark Graduate School of Journalism at the City University of New York. The program funded projects in New York, Seattle, Atlanta and Texas to understand the role that state and local policies play in reducing or exacerbating income inequality. Read other stories in the project here and here. 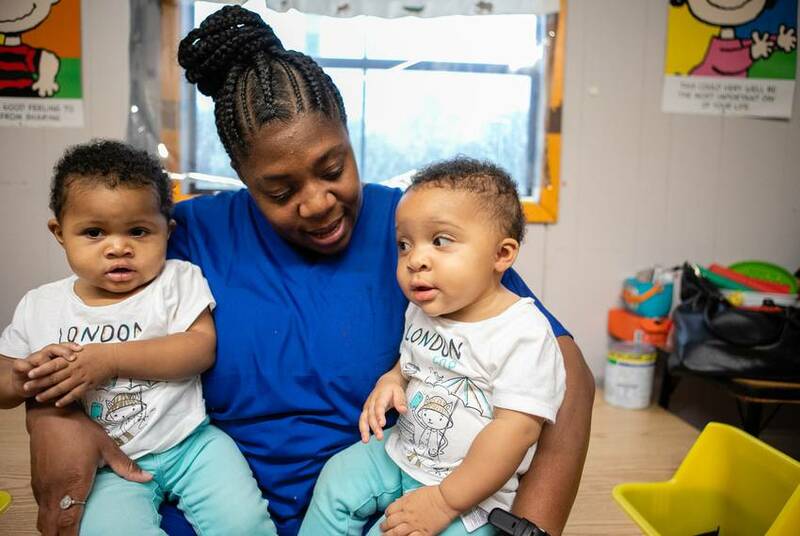 DALLAS — The sun had just broken through the clouds on a rainy Friday afternoon when Kimbley Wilson arrived at Braswell Child Development Center to pick up her children. The bottom of Wilson’s long dress was drenched from the rain outside, and her shoes were soaked. As she sat down, her dark braids flipped over her shoulder and she sighed heavily. “I thank God every day for Friday,” Wilson said. Wilson works part time through a temp service and is going to school to become a teacher. 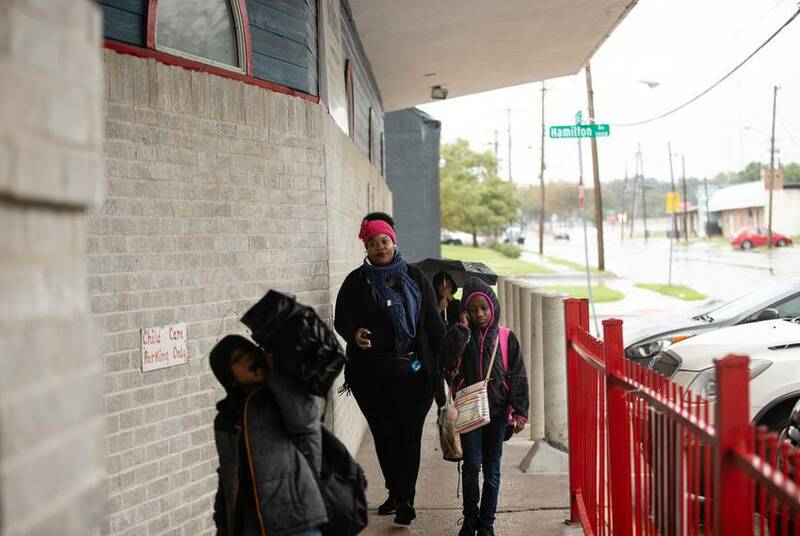 Every weekday, the 31-year-old gets up at 4:30 a.m. and takes an hourlong bus ride to drop her kids — Sariah, 10, Micah, 9, and Knowledge, 6 — at Braswell Child Development Center near Fair Park before she goes to work. Her children attend the center for before and after school care; Braswell provides their transportation to school. As someone who earns $9 an hour and works about 30 hours a week, Wilson qualifies for state-subsidized child care. But finding quality care hasn’t been easy. One year, Wilson tried out four different day cares — she pulled her kids out of one after employees fed her children junk food for breakfast, then rejected another when an employee encouraged her daughter to fight a student who teased her. In Texas, the demand for subsidized child care has swamped the supply — Texas has more than a million children under 13 who could potentially qualify for subsidized child care, but the state helps just over 9 percent of them, according to Children at Risk, a nonprofit that specializes in policy research related to child care, education and health. According to the federal Office of Child Care and the Annie E. Casey Foundation's Kids Count Data Center, Texas ranked 41st nationally in fiscal year 2015 in providing monthly child care assistance to children under 13 who qualified for it, behind both southern states like Georgia, which ranks 25th, and northern states like New York, which ranks 9th. If working parents like Wilson are unable to find child care, they will likely have trouble holding down a job. About seven years ago, Wilson was without subsidized child care for about four months after starting a new job that paid better, but she says she quickly lost it because she couldn’t find child care. The money for subsidized child care comes from the federal Child Care Development Fund. Through local matching, the state will contribute about $122 million to subsidized child care in fiscal year 2019 on top of $806 million in federal money. Texas received a significant bump in federal money for 2018 and 2019 — about $229.9 million more than in 2017 — which has led to shorter waitlists in some parts of the state. Statewide, about 46,500 children were waiting for subsidized child care in September, according to the Texas Workforce Commission, down from about 75,000 in May 2018. Some advocates and lawmakers applaud the increased spending, but fear it won’t do enough in the long run. State Sen. Judith Zaffirini, D-Laredo, said the state should kick in more of its own funding for subsidized child care. “Yes, I believe Texas could and/or should be contributing more, financially, to the subsidized child care system,” Zaffirini said in an emailed statement to the Tribune. Mandi Kimball, director of public policy and government affairs at Children at Risk, said the federal funds don’t give all children who qualify for subsidized child care access to care. “There will be more children served, but it’s imperative that all our kids have access,” Kimball said. To qualify for state-subsidized child care, a family’s income cannot exceed 85 percent of the state median income. The cutoff is $53,476 for a family of three, according to the Texas Workforce Commission, which funnels money for subsidized child care to the state’s 28 local workforce boards. 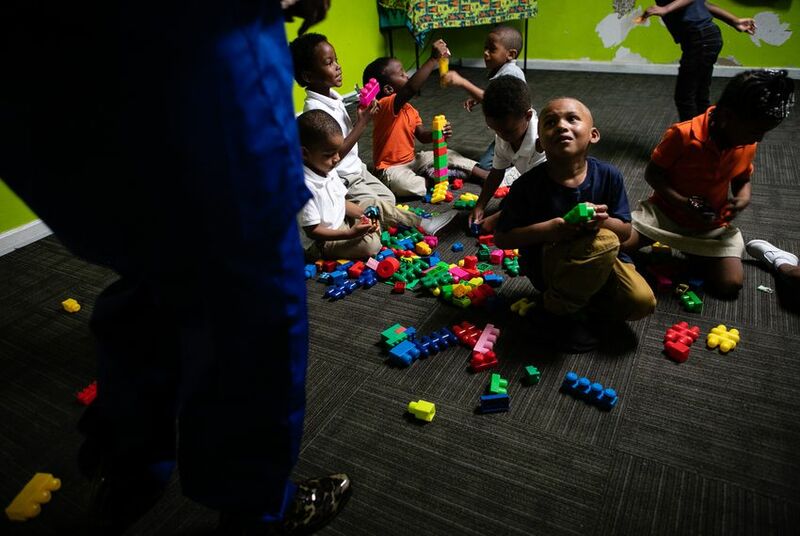 In Dallas County, child care is overseen by Workforce Solutions Greater Dallas and run by board contractor ChildCareGroup. Parents can apply online to get on the group’s waitlist for subsidized child care, but in Dallas County and some other areas, parents do not have to first prove they are eligible — which can expand the list with people who don’t ultimately qualify for subsidized child care. Once a child care slot is available, ChildCareGroup assigns parents a caseworker who will determine their eligibility. Like other state child care contractors, ChildCareGroup has to prioritize who gets child care using state-issued guidelines that give first preferences to groups such as foster children, children of veterans or teen parents. If approved, parents choose from ChildCareGroup’s list of about 860 subsidy providers in Dallas County. Parents’ copayments depend on their household income, family size and the number of children needing child care — for example, a single parent with a 2-year-old and 4-year-old in full-time care who earns $25,000 a year paid about $225 per month in Texas in 2016, compared to $221 per month in Georgia and $143 per month in New York. To qualify for a subsidy, parents also must work or attend some form of formal education for at least 25 hours a week. In Dallas County, about 24 percent of low-income children 6 and younger who qualify for subsidized child care are served by Workforce Solutions Greater Dallas, which had a waitlist of about 6,400 children in September, the second-longest waitlist in the state at the time. The longest was about 12,000 for the Gulf Coast Workforce Board, which serves the Houston-Galveston area. In 2016, the average waitlist time for subsidized child care in Texas was less than six months, according to the National Women’s Law Center. Parents on child care waitlists may be eligible for other child care and education programs like Head Start or public school pre-K, but the state has no system for letting them apply for all of those programs in one place, Everitt said. "We don’t have any space"
Danita Wilson spends most of her day on the move. As executive director of Greater Cornerstone Academy in North Dallas, she’s going from classroom to classroom, making sure things are running smoothly. About 95 percent of the 50 children at Greater Cornerstone attend at a subsidized rate, Wilson said. The center is reimbursed through ChildCareGroup. Aside from ChildCareGroup’s waitlist for subsidized care, the center also has a separate waitlist that stretches six to eight months for children of parents who can afford to pay the non-subsidized rate. The center is almost always at capacity, particularly when it comes to infant care — there’s just 10 spots in its infant room, Wilson said. Two of those 10 spots belong to Triana Anthony’s twin daughters. Anthony, co-director of Greater Cornerstone, said she’s been on ChildCareGroup’s waitlist for subsidized care for nearly a year — she makes $8.50 per hour, barely enough to afford the non-subsidized rate of $350 per week for her daughters. Anthony said she receives a lot of assistance from family to help provide for her children. “Once I get my check, I have to put a lot of it into the child care,” Anthony said. Lisa Givens, director of communications for the Texas Workforce Commission, said the agency will be using the increase in federal funds to help chip away at waiting lists and implement improvements to quality care. The agency says the increased federal money will help 28,000 more children per day receive child care. Lourdes Lopez, the child care program supervisor for workforce solutions in Cameron County, said Cameron County has received a 15 percent increase in child care funds — enough for the border county to eliminate its entire waitlist, which in 2017 had reached about 1,100 children. Lopez said the county’s child care program serves about 4,200 children. “Once we received confirmation that we were going to receive those funds, we started pulling families from the waitlist and started processing their case,” Lopez said. Although some advocates are satisfied with the Texas Workforce Commission’s plan to decrease the amount of children on waitlists, others are still skeptical. Waitlists are still prevalent in large metropolitan areas like Dallas County, which serves about 14,000 kids per day through its subsidized child care program, said Shari Anderson, vice president of ChildCareGroup. The contractor hopes to shorten its list with the new increased funds from the federal government, Anderson said. Despite the challenges she’s gone through, Wilson says the state’s handling of subsidized child care has improved. “It’s gotten better ... At one point in time, if you would stop working or you lost your job, you lose your child care — just like that,” Wilson said, snapping her fingers. The state now gives parents up to three months of subsidized child care after they have lost a job or stopped going to school.